"A natural fertilizer with numerous virtues is gaining ground in France". 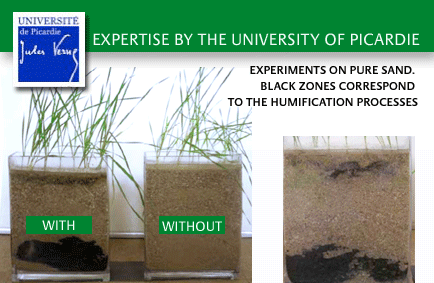 Through developing humus, Marcel Mézy’s process contributes to the reduction of greenhouse gases by a better storage of carbon in soil. During the process of photosynthesis, the air of the CO2 is captured. Marcel Mézy’s process fixes tremendously this carbon into soil through recycling it. It thus enriches the soil storage of nutrients that will provide roots with regular and natural food. 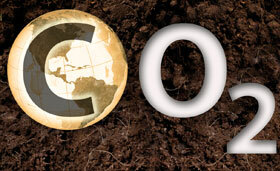 The good development of roots will optimize the "soil-plant" exchange and will contribute to the good growth of the plant. This fixing of carbon can be easily seen in all experiments performed in laboratory. In 2006, a study was carried out by an engineer who was working on the project Grignon Energie Positive at AgroParisTech. He calculated the "costs in equivalent carbon (C)" and "in equivalent carbon dioxide (CO2)" when manufacturing one tonne of fertilizer compared with one tonne of Bactériosol®, applying the method Bilan Carbone® as used by the ADEME. The study showed that one tonne of ammonium nitrate (33.5% of nitrogen) has a cost of 368kg in equivalent C whereas one tonne of Bactériosol® represents only 160 kg. Similarly, one tonne of ammonium nitrate (33.5% of nitrogen) costs 1348 kg in equivalent CO2 whereas one tonne of Bactériosol® costs only 585 kg. Thus Bactériosol® contributes 2.3 times less to the greenhouse effect than a fertilizer with nitrogen. When we calculate the average quantities of fertilizer (NPK) used per hectare (collected by the study ADEPRINA on suckler cows) we notice that a typical breeding farm of 100 ha applying the Bactériosol® method has an average cut of 45% in the equivalent C or CO2 cost compared with a farm working conventionally. Bactériosol® is a carbon sink that acts favorably on the process of humification and on the improvement of the nutritional results of crops.